4.4 out of 5 based on 118 bloggers and 27 commenters. 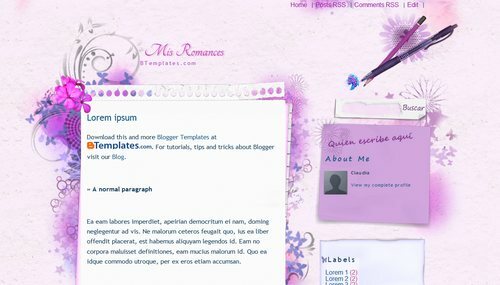 Mis Romances is a free blogger template with 2 columns, right sidebar, an exclusive design for Blogger, girly looking and floral motifs. Excellent template for blogs about desktop or love. Te envié las dos versiones de esta plantilla (inglés y español) esto por que una dice : About me, y la otra dice “Quien escribe aquí” sobre la imagen del post it. @Karla: La versión en español me llegó dos veces, por eso fue la que publiqué. I love how this themes looks like but is it possible to offer an english version, too? It just irritates me and my readers, that there’s so much in a different language. The english version from this template will be uploaded ASAP (you may check in 24-48 hours). Have a nice day. Lo siento Claudia, según yo, te mande ambas, quieres que te la mande? :D Gracias y que tengas un estupendo día! Hola Claudia, disculpa, apenas regreso, lo había olvidado, ya te envíe la versión en Inglés. podria tener la version en ingles tambien ??? how can i find the english version of this templates? @shelyn: You can find it here. Just download the zip file and extract the “Mis-Romances-EN.xml” file ;). @shelyn: Download this file again. The english version is included. I tried to download many times, but still did not have the english version. I mean when i upload the file.The HTML code not in english version. @shelyn: Intall “Mis-Romances-EN.xml”. That is the wnglish version. Love the template, have had a lot of positve comments. Just wondering if there is a way that it can show the date at the top of the post? Hi there, I love this template but I was just wondering if anybody knew how i could change it a little. I want the pages box that overlaps the middle strip to just be at the side instead of overalpping in the middle. And also is it possible to have the about me section with just one about me written at the top? Eu amei essa template, muito delicada e toda em detalhes lilás ela combina perfeitamente com meu blogger mas, não consigo fazer a uploa da imagem ela e colocar como plano e fundo do meu blogger. Como faço para ter ela como meu plano de fundo? Oi, estou usando, to comentando aqui por que não gosto de usar nada sem creditar. Esse template é lindo, está de parabens! I am new to blogging. But how do I customize the contact button on the top. Love everything else. Esta plantilla Me interesa mucho es hermosa, sería mucha molestia si me mandaras la versión Español Por favor te lo agradezco mucho. En http://compartidisimo.com encuentras las versión en español. I haven’t updated my blog template in a while. When i download this I get a zipped folder and an xml file. When I click on the file it just opens an image of the blog header. Where can I get the html code to copy on to my blogger theme edit page?